How to Handlebar Moustache by The Mod Cabin | The Mod Cabin Grooming Co. Among the myriad of moustache styles one stands out: The Handlebar, and for good reason. The Handlebar is not just a moustache, The Handlebar is a way of life. First things first; wash your face! Keeping the area around your moustache cleansed, exfoliated and moisturized is the difference between looking like the inner-Handlebar wearing cool guy that you know you are, or the creepy guy who hangs out at your local independent coffee shop gawking at baristas all day. The Mod Cabin recommends washing your face with an all-natural hot processed soap before growing any kind of facial hair. PRO TIP: A lot of men find birch tar soap works great on facial hair. Now that your face is clean, exfoliate. Scrub off that moustache impeding dead skin by using a good face mud 2-3 times a week. You can also exfoliate the area by brushing with a firm bristle boars hair brush. This will remove all the dead skin and other obstacles to successful moustache growth. Once all the dead skin is removed use a jojoba and argan based beard oil to moisturize and condition the area where you want to grow your facial hair. Just let it grow! You wont need to trim your proto-handlebar moustache just yet. But you will need to comb it by parting each side to the left and right respectively with a saw-cut fine tooth moustache comb. This will begin to train your moustache hairs to go where you want them to go. Moustache hairs are a lot like teenage boys; they do what they want and they just don’t care unless they have a strong hand guiding them. You need to teach your moustache where to go and what to do. You accomplish this by using a firm hold lanolin and beeswax based moustache wax to “teach” your moustache how to lay. It wont take long for your moustache to break down and start doing what you want it to. Remember to be consistent and to comb it and shape it with moustache wax every day. Now that you’ve put in the work, you can begin to enjoy the benefits of your awesome new handlebar moustache. 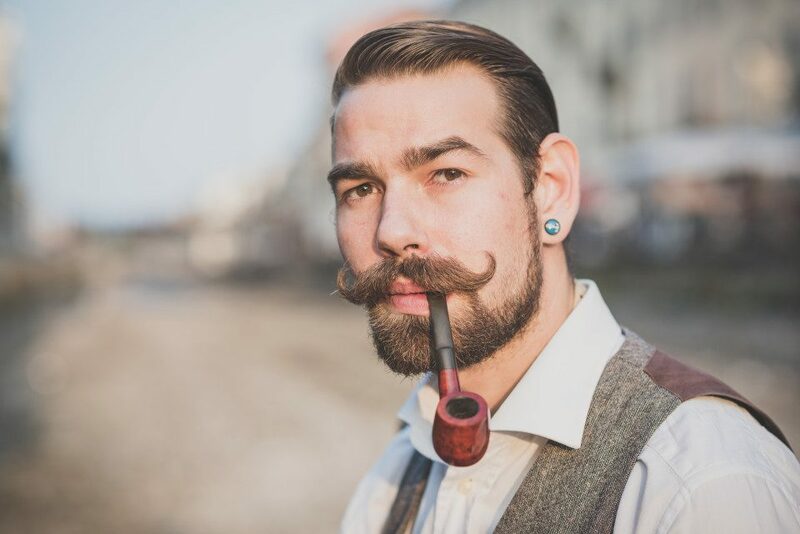 Once your moustache is long enough (generally 8 to 12 weeks of growth) you can finally begin to create your handlebar. Just twist and shout! (Well, twist and curl actually, but shouting in jubilation is a common ancillary consequence when a successful handlebar has been achieved.) After getting out of the shower, while your moustache is still damp, apply a small amount of wax to your moustache and work it through with your fingertips. Then use your moustache comb to further spread it throughout your moustache, combing from the center out to the corners of your mouth. Apply a little extra wax to the hair at the outer corners of your mouth, and use your fingertips to twist the ends of your hair together and curl it up. If your hair is very wiry use more wax as needed. Consistent grooming is the key to great facial hair, be it a moustache, full beard or goatee. In the case of a handlebar moustache, you want to wash your stache’ and the skin around it at least three times a week. The Mod Cabin highly recommends using only all-natural hot processed soap or cleansing oil as other soaps and shampoos tend to damage facial hair. In addition to washing, make sure to exfoliate (scrub) the skin underneath your handlebar moustache to remove dead skin cells and other impediments to facial hair growth. You can do this by applying beard oil or beard balm (or both) to your moustache and brushing through it with a boars hair brush. We cannot stress how important this is. It is the step most men avoid but it is crucial to rocking awesome facial hair. PRO TIP: Make sure your beard balm contains moisturizers in addition to sealants. A good beard balm should contain jojoba, argan, beeswax and/or lanolin. Avoid beard balms and moustache waxes containing petroleum jelly as they can damage facial hair and clog pores. With these tips you are well on your way to growing, maintaining and most importantly ROCKING a Handlebar Moustache!